Hello! I want to give a little information on a new embroidery collection that I drew. 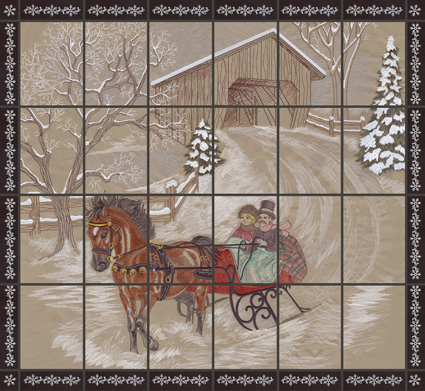 “Dashing Through the Snow,” OESD collection #12359, is a large tiling scene consisting of 24 tiles (not including the border). I’m really excited about how this collection turned out. After drawing for embroidery for five years it’s still amazing to see artwork be transformed into an embroidery design, and even cooler to see those designs get put together to make something! Before drawing this collection I was given no instructions other than to draw a Christmas or holiday-themed tiling scene. 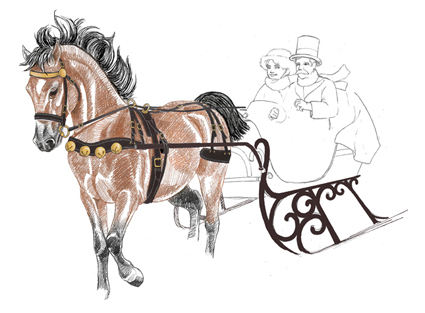 I immediately pictured a big, snowy scene with a spirited horse pulling an old-fashioned sleigh through the snow. 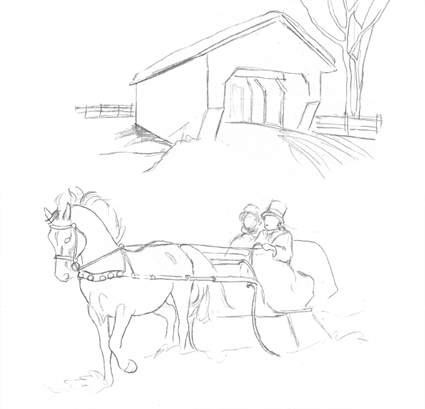 (I’m a huge horse lover, so any time I get to work horses into my artwork I do!) I was inspired to put a covered bridge in the picture by my mother — she loves covered bridges and has a beautiful painting of a snow-covered bridge which has hung in her dining room for as long as I can remember. After the whole scene is drawn it’s given to the digitizer. (Who, I have to say, translated it beautifully!) Then everything gets stitched out and put together, and voila! I fell in love with the design the first time I saw it and could hardly wait to get it and sew it out. I have made two wall hanging and would like to do another one. Thank you sew much for the wonderful art — please keep it up. I love this scene! I plan on purchasing this in the future. I have an interest in this type of business, drawing for embroidery, what advice would or could you give me. And, where would I start? Thank you for your time! Beautiful work! Marion, I don’t have much advice on how to get started drawing for embroidery. I got in to it on accident myself. I actually had never even heard of machine embroidery until I was sitting in the job interview here at OESD. (I just heard that this company in town was looking for an artist so I applied!) There are things to learn and keep in mind when you draw for embroidery (like what a needle and thread is actually capable of) but if you are already sewing you probably have that advantage already! I know various embroidery companies (including OESD) license some artwork from outside artists, so looking in to licensing some of your artwork might be your best route. I haven’t ever licensed my own artwork, but I know there are various ways to go about doing it and it just requires a bit of research on your part. The essential thing is to build up a portfolio!